Sanchi is a small village situated in Raisen district of Madhya Pradesh. It is an important Buddhist pilgrimage site and pilgrims across the world frequent it all the time around the year. Sanchi was known as Kakanaya or Kakanava during the first century BCE as evident from the votive inscriptions on the Great Stupa. During the Gupta period, it has been referred as Kakanada-bota as found in an inscription of Chandragupta II’s reign. A later inscription of seventh century CE refers it as Bota-Sri-Parvata. John Marshall suggests that this Bota-sri-parvata could be the same Sri-parvata mentioned in the Malatimadhava of Bhavbhuti, a work of sixth century CE. R C Majumdar seconds this identification. Being a Buddhist monument, Sanchi does not find place in Buddhist literarute, at least with the name Sanchi. Mahavamsa mentions that when Ashoka was the heir-apparent and the governor of Vidisha, he stopped at Chetiyagiri on his way from Ujjain to Pataliputra. During his stay in Vidisha, he married a girl of a banker, Devi, and by whom he had two sons, Mahendra and Ujjeniya and a daughter Sanghamitra. Buddhaghosha however mentions that place as Wessanagara instead of Chetiyagiri. Alexander Cunningham identifies Chetiyagiri with Sanchi and Wessanagara with Besnagar. If this identification is accepted then it can be said that Sanchi was a Buddhist center before the time of Ashoka as Chetiyagiri literally means the mountain of chaityas. Mahavamsa further states that Mahendra while going to Ceylon stopped at Chetiyagiri in the monastery constructed by her mother. Cunningham also suggests identification of Sha-Chi, mentioned by Fa Hian, with Sanchi. As per Fa-Hian’s account, he travelled 20 miles to the opposite of Ganges bank leaving Kanauj. Then 10 yojana to reach the great kingdom of Sha-chi. After it 8 yojanas to reach kingdom of Kosala. If you follow this route, Sanchi is nowhere in picture, however Cunningham states that there could be a mistake in the direction by the chroniclers of Fa-Hian. Fa-Hian mentions that leaving the town of Sha-chi from its southern gate towards east, you find the place where Buddha planted a nettle which grew to seven feet and stopped at that height. Many Brahmanas later tried to destroy this but the plant again grew to same height. Cunningham mentions that this nettle was probably planted in the stone bowl which is on the eastern ridge of the hill where the Great Stupa is situated. However, Marshall does not agree with the identification of Sha-chi with Sanchi. Though the activities in Sanchi were probably started before the Maurya period, however it became an important commercial town when Ashoka the Great (272-232 BCE) occupied the Mauryan throne at Pataliputra. He is said to have visited this town during his journey to the coronation at Pataliputra. His queen, Devi, was settled at Sanchi and supposedly constructed a monastery there. Ashoka’s son Mahendra also visited Sanchi during his journey to Sri Lanka. All these incidents prove that Sanchi occupied a very important place during Ashoka’s rule. Sanchi became the capital of Shunga dynasty, when Agnimitra, the son and successor of Pushyamitra shifted his capital from Pataliputra to here in 2nd century BC. Shunga ruled the region after the Imperial Mauryas from 187 BC to 75 BC. Generally they are branded as anti-Buddhist but M K Dhavalikar says that this assumption is totally based upon literary evidences. Sanchi witnessed a revival in the construction activities during the Shunga period. In fact some of the grandest Buddhist monuments, at Sanchi and Bharhut, were created during the Shunga period. The most impressive feature of Sanchi, its magnificent gateways, were constructed during the Satavahana rule. An inscription on southern gateway records that ”it was the gift of Ananda, the son of Vasithi, the chief of the artisans of king Sri-Satakarni.” Sri-Satakarni is identified with the Satvahana king Satakarni II who ruled in 1st century BCE. Satvahanas , as per Puranas, ruled over a vast empire in Central and Western India and in Deccan, with their capital at Pratishthan (Paithan near Aurangabad, Maharashtra) for over four and half centuries. Many Buddhist rock-cut temples, like the early group (Hinayana) of Ajanta caves, were carved in Satavahana period. Rudradaman, a Western Kshatrap ruler under the Kushanas, displaced Satavahana rule in around 150 AD. The Kushana activities at Sanchi were of this time only, as they had capital at Ujjain, which is not far from Sanchi. The Imperial Guptas exterminated Kshatrapas in the last decade of the fourth century CE when Chandragupta II annexed Malwa to his empire. Gupta period is referred as the Golden Age of the Indian art and architecture. Sanchi also got lots of additions during their time. The activities at Sanchi suffered a huge setback when the Hunas invaded into India in sixth century CE. However this phase did not last very long and Yashodharman defeated Huna chief Mihirkula in later half of sixth century CE and ended their rule in that part of India. Later Harshavardhana (606-647 AD) achieved some sort of political stability in India. His espousal of the cause of Buddhism brought a fresh lease of life to that religion. The Buddhist community at Sanchi prospered during the seventh and eighth century CE and several monasteries and temples were erected. Thought after the death of Harshavardhana, Northern India again became prey of ambitions of different dynasties, but Sanchi was not affected by this. After the Muslim invasion in about 1000 AD and onwards, activities at Sanchi suffered considerably and came to an end by 12th century CE. Cunningham mentions three reasons for which stupas can be erected. First, to keep the relics of Buddha or similar people, second to commemorate a place associated with Buddha, and third to worship Buddha. However, Marshall mentions that Stupa were seen as funeral mounds and there was no reason to suppose that prior to Ashoka’s time these acquire any sacred character among the Buddhists. As per Mahaparinibanasutta, a Buddhist text, when Buddha was breathing his last, he called his favorite disciples, Ananada and Sariputta Moggalana, and told them that after his death (nirvana) his body should be cremated, his ashes – his bodily relics, should be distributed, and stupas should be erected over them at the crossroads. It is somewhat surprising that the Buddhists selected Sanchi to erect one of their most imposing edifices in the country though the place does not appear connected to Buddha’s life as many of the Buddhist pilgrimage sites are either associated to some event in Buddha’s life or where his relics were buried. If we reject the identification of Sha-Chi with Sanchi as Marshall suggests, then the Chinese pilgrims, Fa-Hien (399-411 CE) and Hieun Tsang (629-641 CE), who came to India ostensibly to visit Buddhist religious centers, do not mark any reference, even a passing one, to Sanchi. Then why did Ashoka erected such a grand monument at Sanchi? 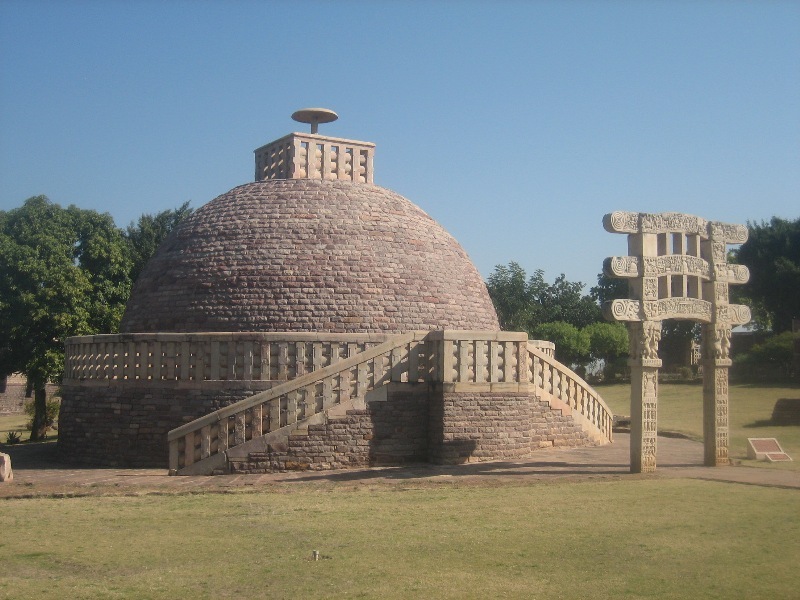 When Ashoka became king and developed love for Buddhism, he selected Sanchi to erect the stupa because of his past association with this town. His one queen, Devi, was said to be staying at Vidisha. When he met Devi at Vidisha, he also visited Chetiyagiri which probably is the same as Sanchi. It is here where Ashoka get acquainted with the Buddhist doctrines and community. That’s why when he ascended the Mauryan throne, he provided all the means to support the community here. The dedicatory inscriptions at Sanchi show that the prosperity of the Buddhist establishment here was, to a great extant, due to the piety of the rich mercantile community of Vidisha. Vidisha was on route from Mathura to Pataliputra, the royal enclave of ancient times. Sanchi got the patronage of the business community of Vidisha and thus the activities at Sanchi continued till 12th century CE. However with the decline of Buddhism in India, Sanchi was deserted in the 13th century CE and became desolated forever. We do not know what exactly happened at Sanchi after the thirteenth century, whether Buddhist deserted the site or gradually lost the vital force to maintain their individuality in the face of all-absorbing force of Brahmanism. It was rediscovered by Captain Taylor in 1818 who reports it in a good state of preservation with the three gateways of the Great Stupa still standing except its southern gateway and its balustrade was in situ. Captain Fell visited Sanchi in 1819 and published his accounts in the third volume of The Journal of The Asiatic Society of Bengal. 1822 Captain Johnson, the Assistant Political Agent of Bhopal, opened the Great Stupa from top to bottom on one side and left a vast breach in it, which was the cause of much subsequent damage and the collapse of the western gateway and portions of balustrade. He was also responsible for the damage to the stupa 2 and 3. The monuments at Sanchi were studied in great detail by Alexander Cunningham and General F. C. Maisey in 1851. Marshall mentions that though Cunningham and Maisey were able to recover precious relics however they caused much damage by the technique used in their excavation. In 1881 major Cole, then the Curator of the Ancient Monuments, cleared up the hill top vegetation, filled up the vast breach made by Johnson, re-erected the western and southern gateways and also the only gateway of the Stupa 3 during his work of two years. However he only did the conservation of these two stupas but no other monument. Sir John Marshall, then Director General of Archaeology, took up a large scale repair work during 1912-1919. He also established a museum at the site in 1919 to keep all excavated antiquities. Massive conservation work measures have been taken since 1947 when the Government of India took over the monuments from Bhopal state, and now the Stupas at Sanchi stood in all their pristine glory.